Social enterprises are innovative not only in the type of services and goods they produce, but also in the structures and processes by which they pursue their social and economic goals. Consequently, issues of governance—understood as both the legal and regulatory environment in which social enterprises operate as well as their internal policies, strategies and management—require careful consideration. Among the most important aspects of governance relevant to your organizations’ capacity to launch and sustain a successful social enterprise include clarifying your community and organizational goals and mission, creating a structure and strategic plan that allows you to effectively pursue your goals, and developing guidelines and procedures for managing human resources fairly, promoting effective, inclusive, and accountable decision making, and measuring outcomes to maximize social impact. This section offers a wide variety of information, links, and resources designed to help get you started in thinking about governance and how it relates to developing a sustainable social enterprise. Boards and Decision Making Bodies offers information on the formation of a board of directors and the legal responsibilities and functions they entail, including information on developing participatory governance. Mission and By-Laws provides information about developing a mission statement and examples and guidelines on the creation of by-laws. Code of Ethics provides examples and guidelines to creating a code of ethics for the organization to follow. Business Plans and Strategies for Development provides resources and information on what should be included in the non-profit’s business plan and guidelines and strategies to continue to develop and successfully implement that plan. Human Resources and Employment Issues offers information on managing personnel and financial information for employment practices, including the benefits of cultivating a diverse workforce. Measuring and Accounting for Success provides examples and suggestions for evaluating results, with a specific emphasis on measuring social value to ensure success. The key governing body of social enterprises is usually the board of directors, which has the responsibility for making key decisions that allow the organization to fulfill its mission. Among social enterprises incorporated as nonprofit organizations, a board of directors is required to receive tax-exempt status from the federal government, to carry out the legal and fiduciary responsibilities, and publicly assure legal operations. · How often should boards meet? · What are the responsibilities of board membership? · What is the best size for a board? · Should the board have committees? The Ontario Cooperative Association has also produced several useful documents regarding electing board members and running effective director and membership meetings. Inclusive, participatory governance is a key feature of the social economy. Below you will find a few key pieces that help to illuminate its importance along with specific resources to help you to foster participatory democracy in your organization. The following document, “Stepping Stones to a Solidarity Economy” is available on the U.S. Solidarity Economy Network’s website (http://www.ussen.org) as an exercise designed to give people exposure to a wide range of solidarity economy initiatives. It also provides an opportunity to discuss, critique, and elaborate on the wide array of solidarity economy initiatives. Co-op Governance Panel: Quintin Fox highlights Quintin Fox’s address to the Co-op Governance Panel. 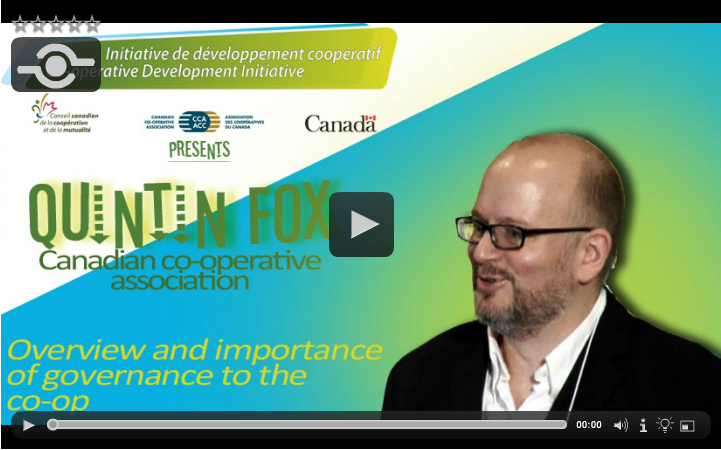 Mr. Fox discusses an overview on co-op governance and why governance is important. He covers board and director development, what sort of competencies might be involved in finding a director and creating a board, what is governance, and why is it important. An organizations’ mission statement communicates its core values, guiding philosophies and key social as well as organizational priorities. Below are a variety of resources which demonstrate how and why mission statements are important and why they are critical for communicating to external audiences, but perhaps more importantly, establishing the foundation of the organizational culture on which your social enterprise will be built. The Association of Specialized and Cooperative Library Agencies (ASCLA) has two guides relating to the development of the mission statement as well as the values and philosophy a social enterprise abides by. The core underlying purpose of the organization is laid out in the mission statement and is the first major step in the strategic planning process. It must be understood and agreed upon by all of the social enterprise’s stakeholders, the Board, the staff and members. Another important step in the planning process is the organization’s ability to articulate the essential foundations of its organizational culture through its values and philosophy. Unlike the mission statement, these might evolve overtime as a wide range of cultural values expand over the changing organizational environment. One of the most fundamental tasks for social enterprises to accomplish is to develop by-laws. These by-laws establish the purpose and mission of the company along with the guidelines and principles it will uphold. Not only do these by-laws dictate how the company is run, but it also provides established rules for the board and committee’s including voting and decision-making. Another important step in the development of social enterprises is the formulation of a code of ethics to guide decision-making and responsibility. The code of ethics should reflect the organizations key values, as well as the by-laws. It helps to uphold a system of accountability for the organizations leaders, managers, and employees and helps communicate the core identity of the organization to external constituencies. The Association of Fundraising Professionals (AFP) has been the standard bearer for this critical part of nonprofits for over 40 years. Its Web site (http://www.afpnet.org/) has a major section devoted to ethics and standards. While establishing the fundamental laws and codes that the social enterprise will adhere to is important, developing a plan and strategy to carry out its mission and goals is essential to sustaining the business. The following sections will examine the concept of a business plan and tips on how to develop one based on the social enterprise’s purpose. Once the business plan is created, developing a strategy to carry out this plan is also important to adhere to its original purpose. Another section dealing specifically with strategy will offer resources and guidelines to developing a strategy to go along with the business plan. Human Resources and employment issues are core components of developing a social enterprise. Aside from the formal aspects of developing employment and personnel policies and protocols, human resources involves recruiting participants—both volunteers and employees—and helping individuals and teams work fairly and effectively to accomplish common goals. Solidarity amidst diversity is an important element of the social economy. The economic and cultural benefits of cultivating a diverse workforce are well established. In addition to fostering diversity through promotion and recruitment of employees, it is important to cultivate diversity within leadership and decision-making making bodies, such as the board of directors and key management positions in order to incorporate a wider range of experiences and ideas. This not only helps to foster innovation, but promotes greater creativity, productivity and social inclusion, thus strengthening communities more broadly. Over the course of the last decade, considerable emphasis has been placed on evaluating and measuring outcomes to demonstrate success. There are a variety of ways to define, let alone measure success. Typically measures have focused on economic productivity and organizational output, but today one of the key challenges facing social enterprises is how to evaluate and communicate social value. The National Council of Nonprofits has a section dedicated to the reasoning behind and importance of measuring outcomes for social enterprises as well as offering resources and guides for Self-Assessment, Effective Program Evaluation, and Outcome Measurement and Analysis. For additional ways to measure outcomes of success more specifically different ways a non-profit organization can evaluate itself through areas such as Ethics, Organizational Culture, Financial and Organizational Planning, Volunteerism, Marketing, Community Involvement and more, view the “Principles of Effectiveness worksheet” provided by ASU’s Lodestar Center.